We were very privileged to spend the last ten days in Northern and Southern California. 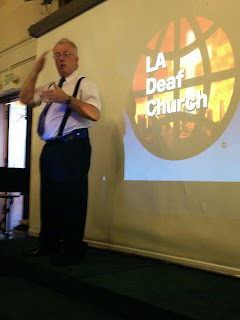 We had some great meetings, and for our last service we were invited to speak/share with the people of the Los Angeles Deaf Church. Its is always a privilege for us to share with a deaf community in America, and this was no exception. We have discovered that the deaf in America have a heart for deaf people around the world. The struggled they face seem, to transcend country boundaries and cultural lines and they are left with the simple fact that they are the same. The idea that sign languages are different, is a fascinating idea for them, and they love to watch Renee sign in Chinese Sign Language. We are privileged to be a able to reach this awesome group of people, and to share with them the awesome news of a loving Father and creator. We are hoping that more doors open in America, so we can continue to help the deaf reach the deaf.